New season, new Manchester City. 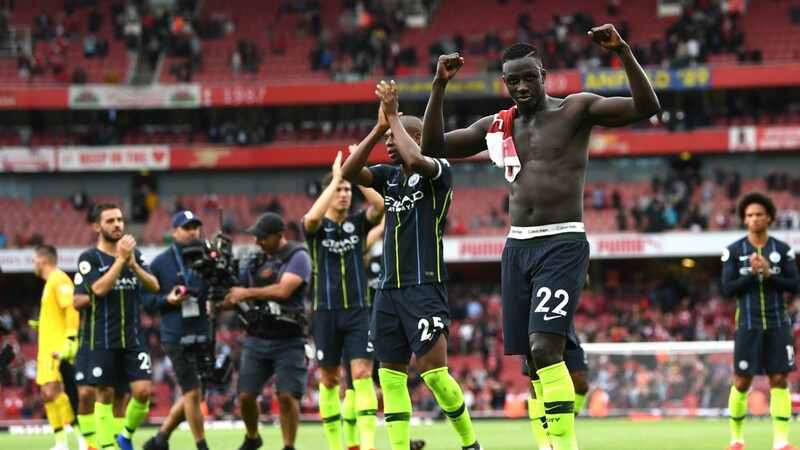 The Community Shield win against Chelsea last weekend suggested nothing had changed for Pep Guardiola’s defending champions but their Premier League debut at Arsenal proved there are fresh dimensions to this intriguing side, for better and for worse. Guardiola has said he expects his side to improve this season – in terms of performances if not records – and he is working hard on coming up with new ways to combat deep, stubborn defences. The Catalan did not expect that from Arsenal on Sunday and indeed he did not get it, but he came up with a new shape to combat Unai Emery’s new-look team, and provided a glimpse of things to come this season. This was not the City we saw for most of the previous campaign. The fundamental principles were the same, of course; they pressed, wanted to dominate the possession and tried to break quickly. But the basic shape and the roles within it were altered considerably. City actually defended in a 4-4-2 rather than their usual 4-1-4-1. Sergio Aguero and Bernardo Silva went to press first, then Raheem Sterling and Riyad Mahrez followed. Kyle Walker made more bursts down the flank than he has had to do for months. Benjamin Mendy did not fly down the wing but the middle as well. Raheem Sterling started on the left and cut inside, his goal not a simple finish from close range but a pearler from outside the box, only the third of his career. It was all very unusual. It was Manchester City, but not as we know them. And not just because Leroy Sane and Fabian Delph, the mainstays on the left-hand side, did not start. It was not even because Bernardo Silva and Ilkay Gundogan had to fill in for the imperious David Silva and Kevin De Bruyne. And it was not just because Mendy was back. A serious knee injury deprived the Frenchman of most of his first season at City but in the opening months of last season he showed how he can fly down the left and fire in wicked crosses for his team-mates. Most expected Mendy to do exactly that now he is available again, to change City’s game because he can do what Delph cannot (and presumably could not do what Delph can). Yet his role was completely unexpected, and in fact it could be the crucial element of Guardiola’s latest plan. The former Monaco man fused his 2017-18 role with Delph’s; that is to say he bombed forward, wreaking his usual havoc, but often from a central position. Without the ball he defended the left flank but in the build-up he he would appear next to Fernandinho, bolstering the middle like Delph has done so well, and then he would take off, joining the attacks either through the middle or out wide. His performance was far from perfect in many respects; he offered up possession too easily, he missed challenges, and he lacked the tactical discipline Guardiola was looking for. After the match it was put to the Catalan that Mendy was even playing centre-forward at certain stages. Seemingly that was one step too far. Even so he racked up two assists (even if Sterling and Bernardo Silva did the legwork with the finishes) and just as importantly he showed how dangerous he and City can become when he is fully fit and familiar with the role. City staff expect him to be back to his very best around Christmas. His role obliges City’s wingers to play on their ‘weaker’ sides and cut inside onto their stronger foot, which mostly explains why Sterling played on the left instead of Sane. Crucially, however, it means City can switch between this new system and their familiar, title-winning shape during matches. With Mendy, Walker, Bernardo Silva, Sterling, Riyad Mahrez and Kevin De Bruyne on the pitch, Guardiola has players with the flexibility to carry out several very different roles during the course of 90 minutes. Should the opposition prove adept at dealing with one approach, City should, eventually, be able to switch to another without making any substitutions. It was hard enough for teams to cope with the more subtle in-game changes that City deployed last season, of course, and indeed Guardiola’s celebration with Mikel Arteta following the Blues’ second goal on Sunday suggested the former midfielder, who now has greater responsibility on the coaching staff, came up with another little masterstroke to help kill off his former club. Yet for all that City’s season opener also felt very different because they looked far from polished. Ilkay Gundogan was incredibly wasteful in midfield. Mendy, as mentioned, was culpable of some shocking errors. In the final 10 minutes Ederson played three terrible passes, which is probably more than the total number he played last season. Even De Bruyne did not look himself when he came on and he made a mess of what was, for him, a routine through-ball. Sergio Aguero, who looked so sharp at Wembley, missed a sitter. In fact, he looked isolated up front at times given his team-mates were not instructed to join him in the box and wait for tap-ins – perhaps that will need to be tweaked as the season goes on. At times it beggared belief that Arsenal not only got away without conceding three or four in the first half, but that they did not punish the mistakes City were making near their own goal. There can be many legitimate reasons for those aspects of City’s un-City-like performance, not least post-World Cup rustiness and the unfamiliarity of the new system. But they still won, and they deserved to. Guardiola’s team is evolving.